I originally had this yarn spun up for my Vermont Yarn Club, and for them offered it along with some free patterns and some information about the breed and its history and characteristics. But I had some remaining from that CSA and so decided to offer it here. I purchased lamb fleeces only, so as Icelandic wool goes, this yarn is soft. But it is not merino! Icelandic is known for being "dual coated" ( a softer undercoat and a coarser outer coat). In lambs, the outer coat is not as prevalent and what there is of it is softer, so these fleeces are softer than what you might expect from Lopi. I have it available in three natural colors. For some neat pattern ideas, check out one of the recent books published about Icelandic or Northern knitting traditions. 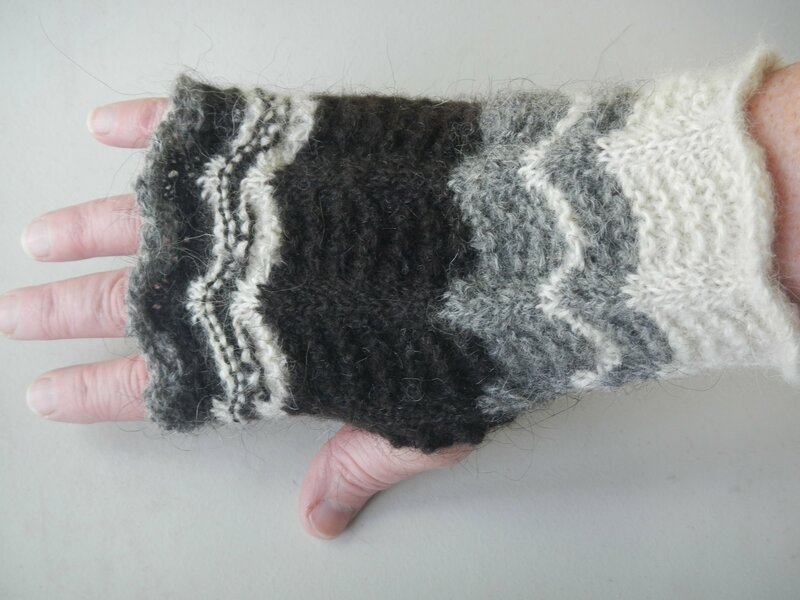 There is a tradition in Iceland of knitting shawls and also of knitting wristlets in a feather and fan type of lace pattern and working the natural colors in wide bands/stripes. Also, if you've been interested in knitting any of the slippers from Nordic Slippers, this yarn would be perfect!